The U.S. International Trade Commission has just released April 2016 export/import trade data. 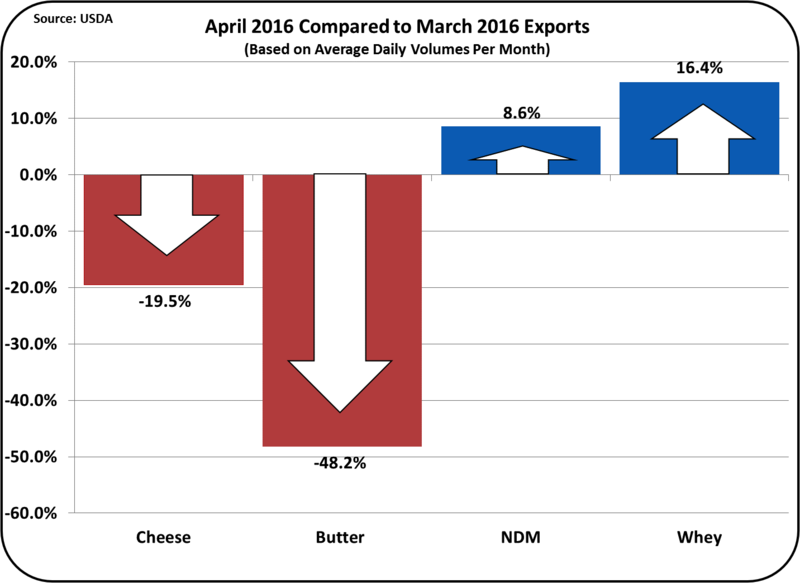 Dairy Exports continue to be well below prior years and imports remain strong. International surpluses and a strong USD mean that U.S. dairy commodities must be sold at low prices to meet competition from other countries. 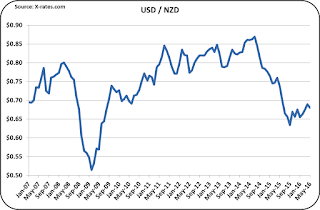 Net exports (export minus imports) will be the primary focus of this post as both exports and imports impact domestic inventories and in turn producer component and milk prices. The percent changes from the prior month are shown below. 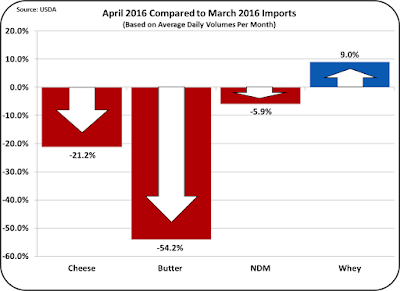 The changes for butter imports and exports look huge, but they are based on small quantities. Butter exports remain close to zero as shown later in this post. As mentioned in the prior post, butter is a very volatile dairy commodity at present with a good chance of significantly falling prices. 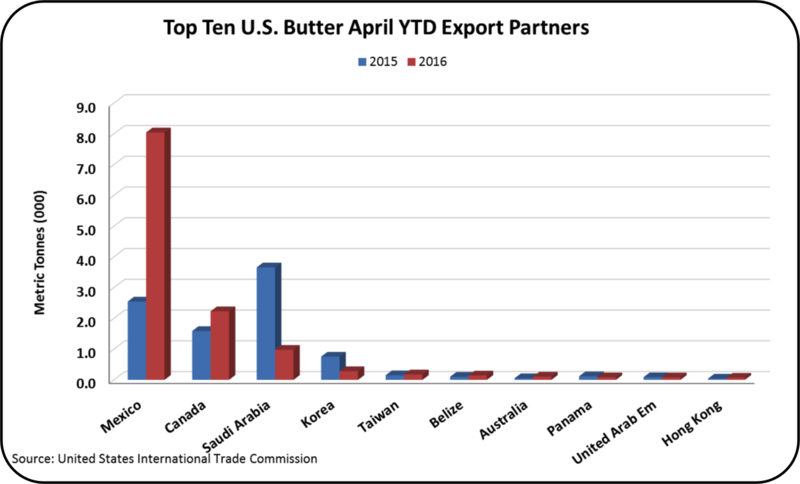 Butter exports are primarily exports to Mexico, with a little to Canada. Beyond that, exports are very very small. 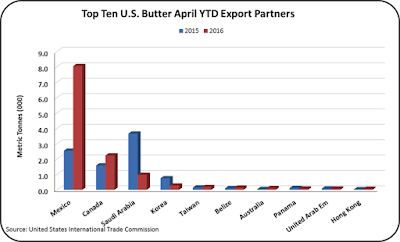 If it were not for the spike in butter exports to Mexico, U.S. butter exports would be miniscule. 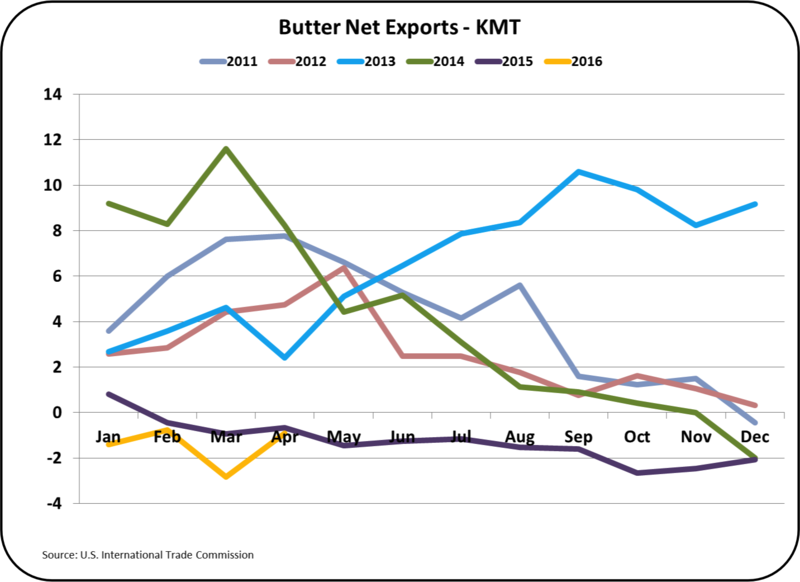 Butter imports were less than half of the prior month, but that's because the prior month was a bit of an abnormality (see chart below). 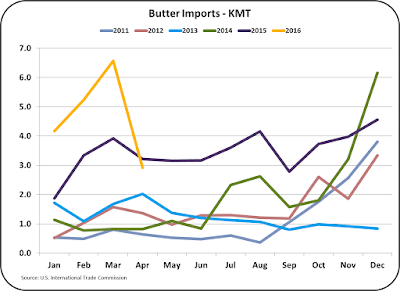 That may very well be because butter inventories have started to rise (see prior post) and spot purchases of international products are the easiest to curtail as compared to contracted supplies within the U.S. 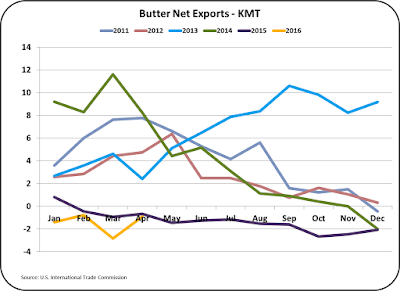 In total, net butter exports are continuing to be negative, meaning that more butter is imported than exported. 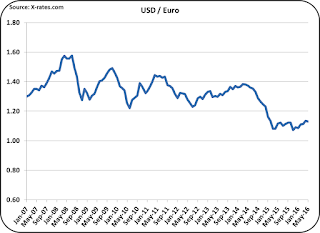 The prices of U.S., Western Europe, and Oceania are shown below. 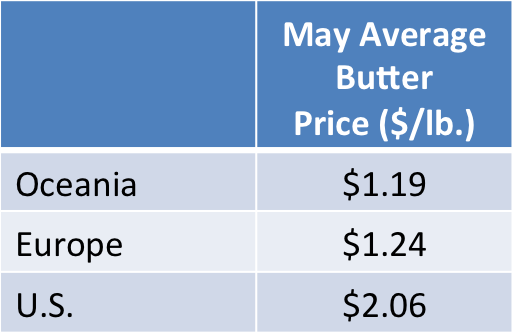 While the price disparity is less than previously, U.S. butter is still at a much higher price than other international sources. As discussed in the prior post and other posts to this blog, butter prices are destined to fall. The fall in butter imports for April should not be taken as trend, but rather an abnormality. 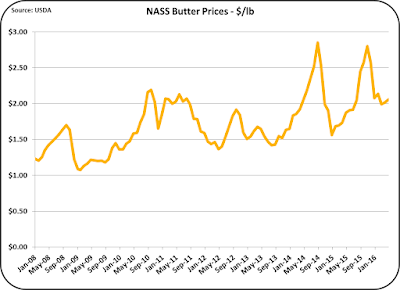 As butter inventories build, as they are, U.S. butter prices will fall. As a reminder, while this reduces the price of butterfat for the producer, it will also increase the price of milk protein and have little impact on the Class III or mailbox milk prices. (See two prior posts for details on this relationship - "The Math Behind Milk Protein and Butterfat Pricing" and "Is Milk Pricing really tied to Cheese Prices." 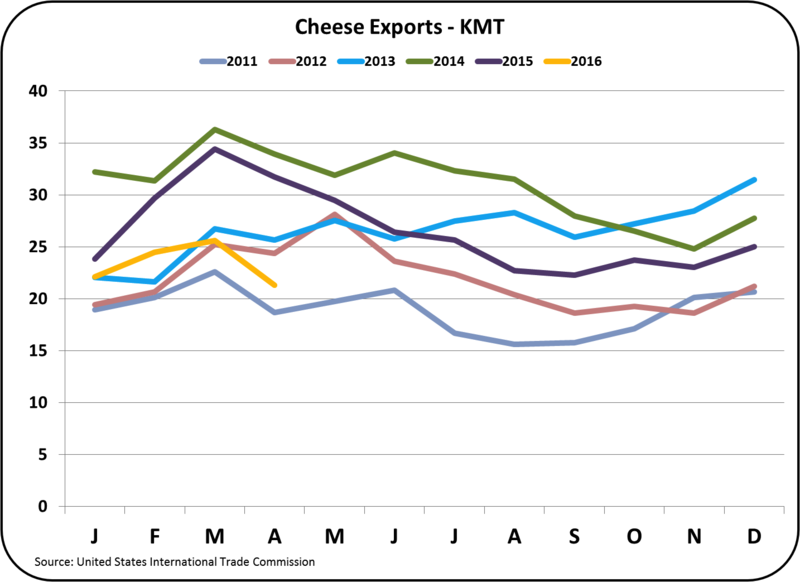 Cheese exports continue to fall. Cheese exports were the lowest in five years for the month of April. 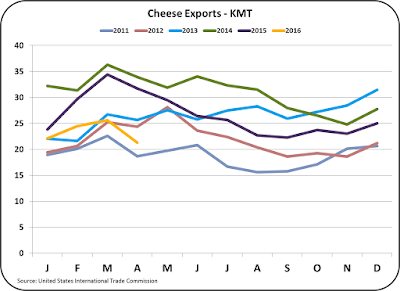 This is a serious problem as cheese inventories continue to build (see prior post) and, as a result, cheese prices and the Class III milk price continue to fall. The only countries buying consistent amounts of cheese from the U.S. are Mexico and Canada, the same as butter exports. 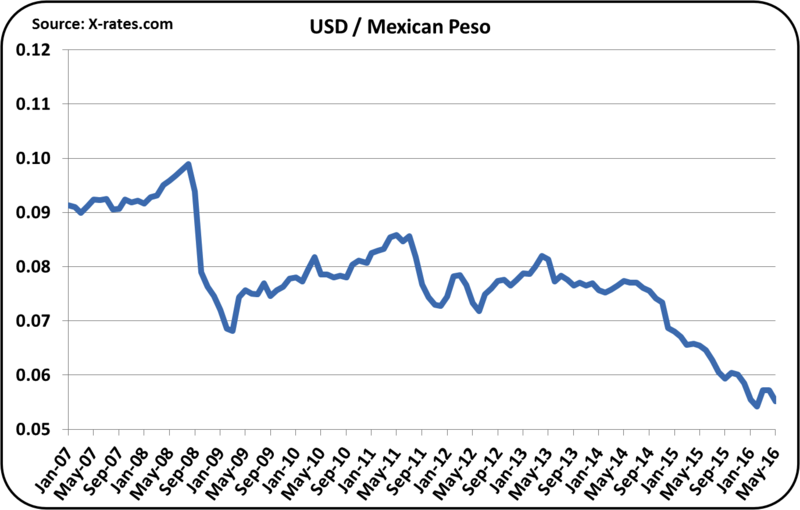 Exchange rates have played a major role in the demise of exports and the increase in imports. 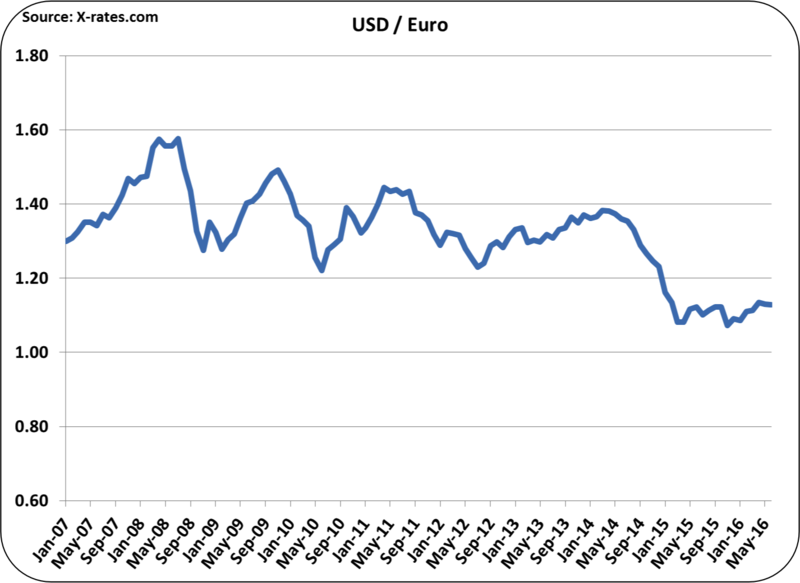 The U.S. has shown financial recovery in advance of most other countries and as a result the USD has strengthened. 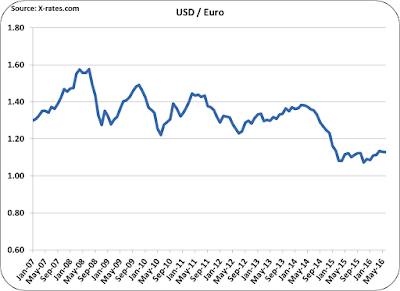 However, exchange rates do seem to be stabilizing and trending to a weaker USD. 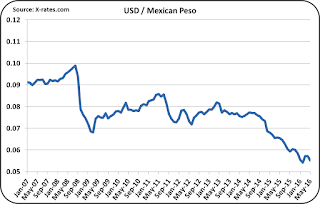 The three charts below compare the USD to the Euro, the New Zealand dollar, the Mexican Peso. The first two are the major international supply competitors and the last, Mexico, is the largest U.S. importer. 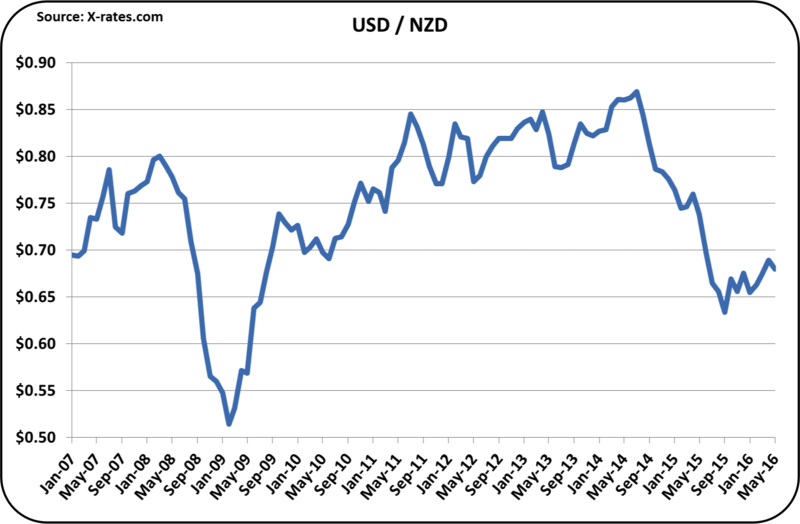 A normalization of exchange rates will help increase net dairy exports, but will still leave the issue of international oversupply. The oversupply issue will take longer to normalize. These facts suggest that the current low producer milk prices are near a bottom, but real recovery is still a long way off. Stay up-to-date with future posts to this blog. On June 2, 2016, May Class and Component milk prices were announced. Cheese and therefore the Class III milk price were down significantly. Class III milk fell to $12.76/cwt. and milk protein fell 19.1% to $1.49/lb. The high inventory levels of cheese and the resulting low price were responsible for this drop. Cheese was covered in some detail in the prior post and there are no updated analytics available at this time. For this reason there will be little coverage of cheese data in this post. Low exports and rising imports and the resulting high inventories are responsible. The Class IV price rose slightly on a small gain in the international price of nonfat dry milk. 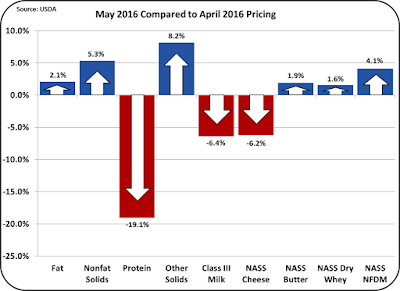 Dry whey and butter prices had very little movement resulting in relatively stable month-to-month pricing. 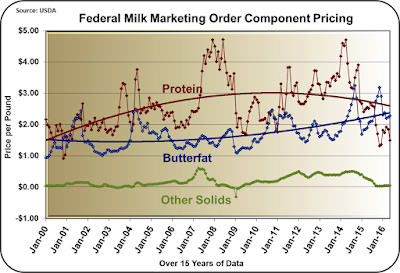 By formula, the value of other solids and butterfat also remained relatively stable. The low price for milk protein is near the 2015 year end prices, which were 16 year lows not seen since the year 2000. 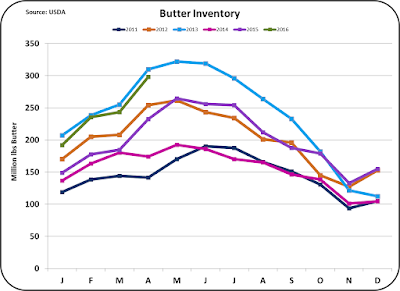 Butter inventories are rising to levels not seen since 2013. 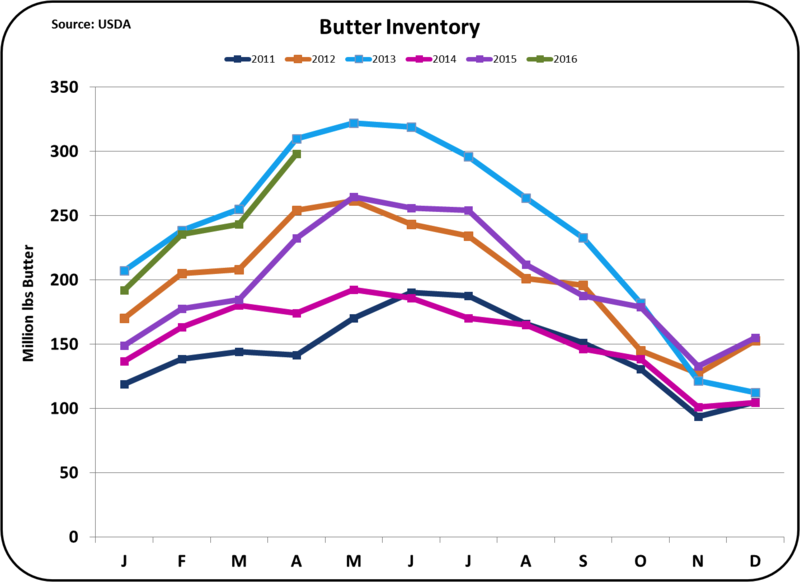 Butter inventories have increased as low priced imports have risen. With higher inventories, prices typically drop. 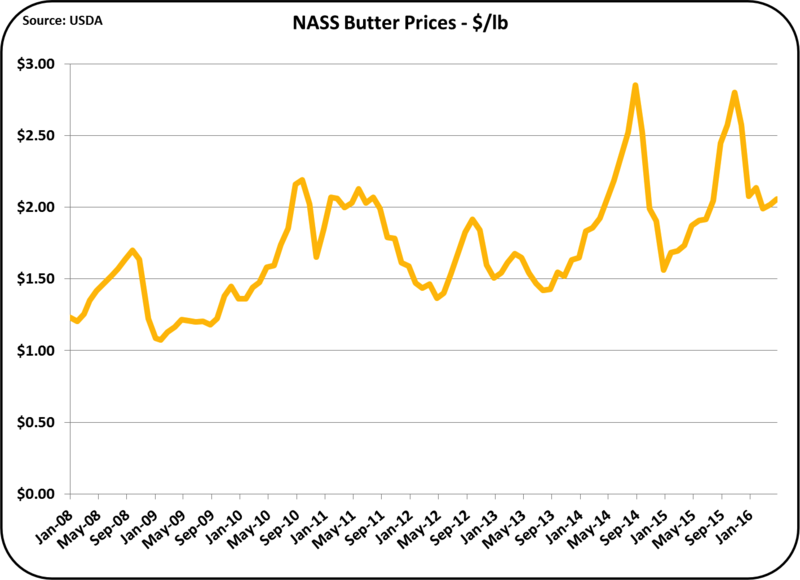 While the price of butter is still over $2/lb., with inventories now running at 2013 levels, a price drop to 2013 level pricing is inevitable. This would reduce the price of butter to the $1.50/lb. level, a 25% drop in value. 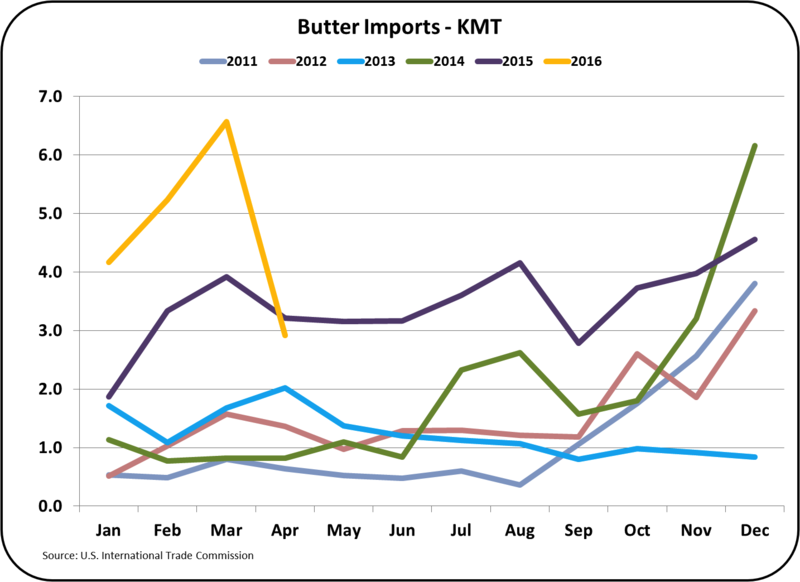 The futures markets have not reflected this change in spite of the four month running increase in butter inventories to 2013 levels. 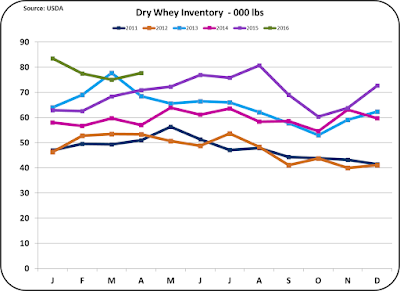 The value of Other Solids have been hovering close to a zero since mid 2015 as the price of dry whey, the basis of Other Solids pricing, remains low. Inventories are running slightly above historical levels so little improvement in pricing can be expected. 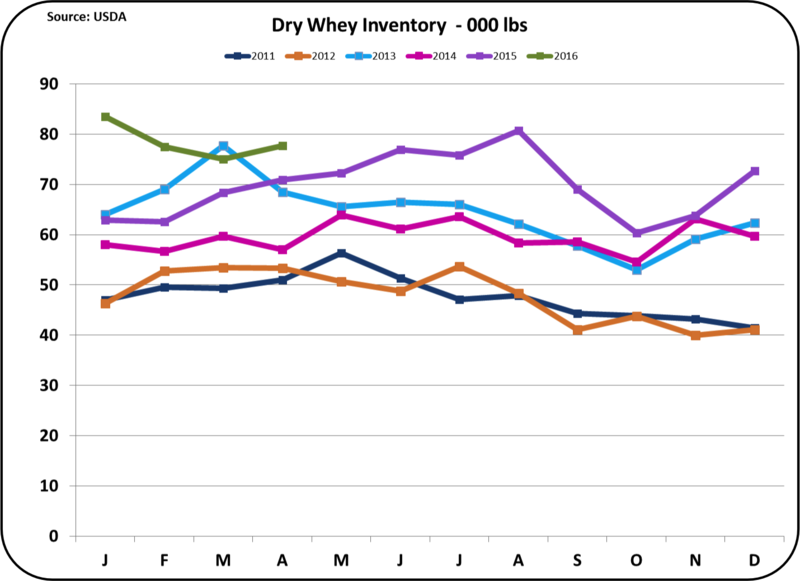 If the value of dry whey falls further, it may not be economical to spend the money to dry the whey. Dry whey is primarily an export item. 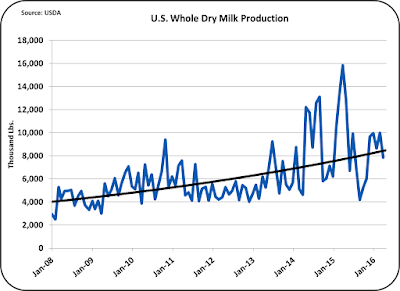 One developing positive trend is the growing production of whole milk powder. Whole milk powder is more expensive to package and transport as the butterfat in WMP must be protected from oxygen and heat. The international market for WMP is much greater than NDM, but U.S. production of WMP has ranged below 10% of the NDM production levels. 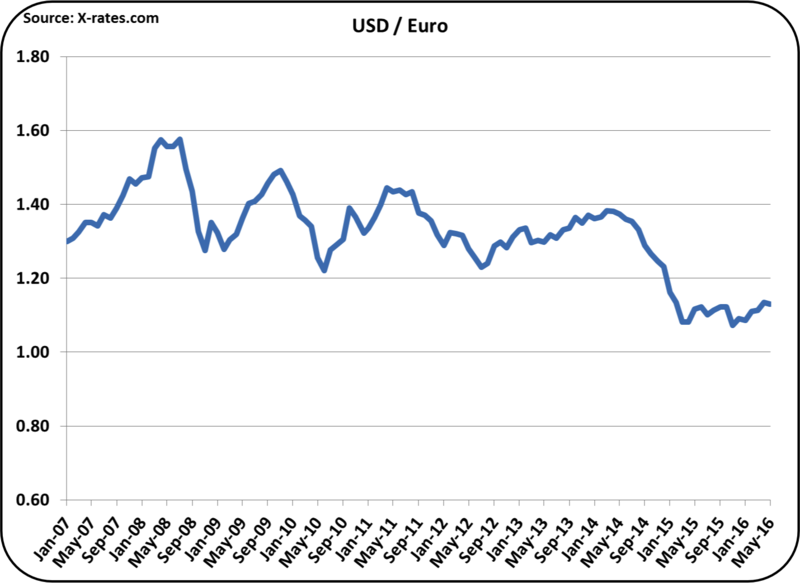 The long-term trend of growth is positive despite low international prices. WMP prices by formula do not impact dairy producer prices, but can impact overall demand for milk and thereby have a pricing influence. In summary, there is little reason to be positive on cheese, milk protein, dry whey, or other solids pricing. 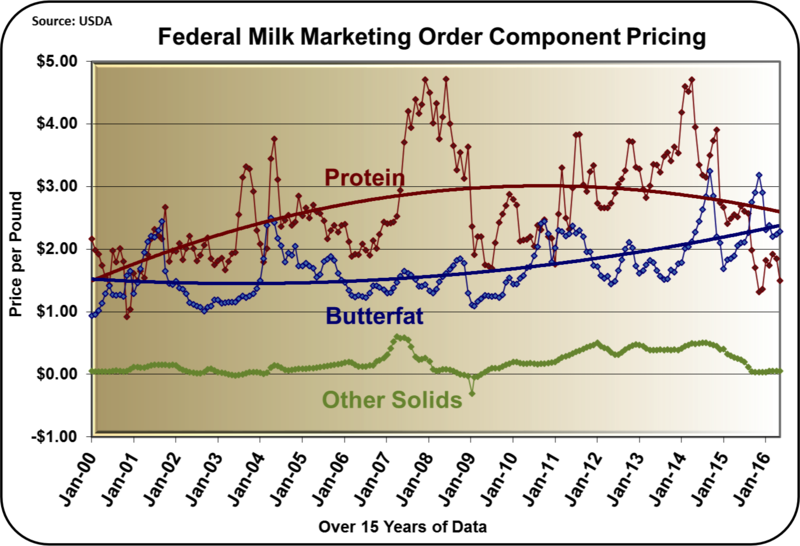 The only change that analytics suggest is a drop in the price of butter and a resulting drop in the price of butterfat. Until international oversupply is reduced, there is little hope for improved pricing. While the oversupply will eventually be corrected, there is little to support a quick resolution. 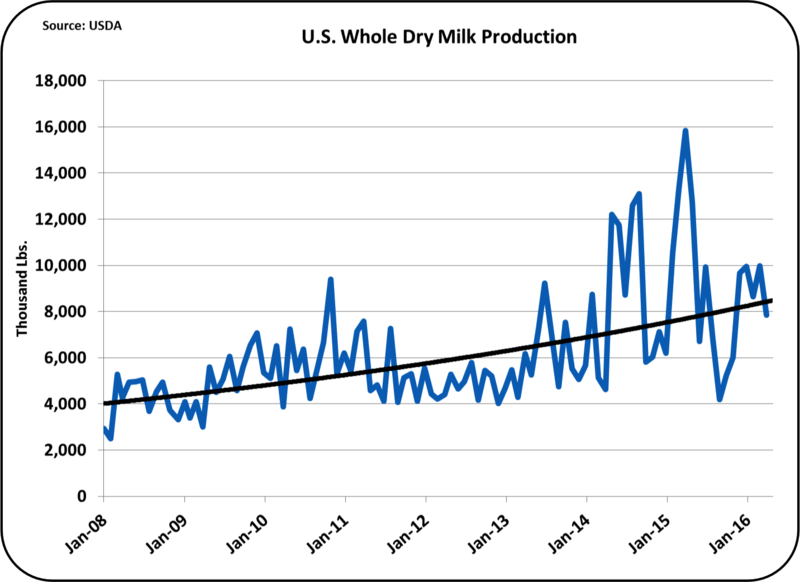 This will certainly eliminate any inefficient U.S. dairy producers, but that will not resolve the international oversupply. 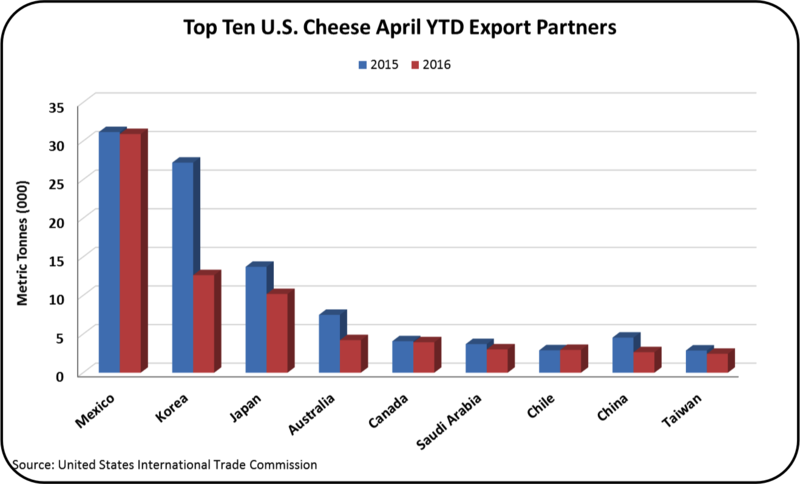 When data is available, the next post will cover U.S. dairy exports and imports and the international market influences.